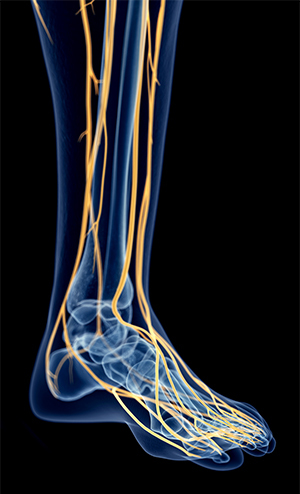 Nerve care for your lower limbs is one of the services we are better equipped to provide—both by state-of-the-art technology and our highly-educated, skilled doctors—than any other practice in the greater Austin community. As with any part of your body, your feet and ankles are connected to the larger nervous system, which controls movement and enables physical sensations to be experienced. Sometimes issues arise within in this system, but our experts at Austin Foot and Ankle Specialists can accurately diagnose the issue, and then provide effective treatment to resolve it for you. The best starting point when it comes to peripheral neuropathy is your nervous system. This essential system is divided into two subsections–the central nervous system and the peripheral nervous system. Essentially, your central nervous system is comprised of your spinal column and brain. It is responsible for processing information and determining appropriate responses. The peripheral nervous system is an elaborate network of nerves running throughout your body. These nerves are, in part, responsible for collecting information and then conveying it to your brain. Burning or tingling sensations. Due to damage sustained by the peripheral nerves, they may report faulty signals to the brain, such as burning or tingling sensations that should not exist. Nerve pain. In addition to burning and tingling, the condition can also cause sharp pain in your lower extremities. Cramping or muscle tightness. Motor nerves control muscle movement and, when damaged, these nerves can cause problems in the muscular system. Numbness. Perhaps the most concerning of all peripheral neuropathy symptoms, nerve damage can cause numbness when nerves are unable to relay any signals to the brain. Additional problems that can develop include faulty sensations (the feeling as though you are stepping on a nonexistent object, like a pebble, is fairly common), difficulty walking, and disrupted gait cycles. Nerve damage often results from systemic diseases, but a full 30% of causes are idiopathic (which means they stem from unknown causes). The key for successful treatment is early detection. For this reason, make sure you schedule the earliest possible appointment with one of our Austin, TX offices if you are experiencing any of the aforementioned symptoms. When you come in for your appointment, we will begin by evaluating your situation so we can ascertain an accurate diagnosis. Diagnosing neuropathy begins with an examination, including asking questions about your symptoms, medical history, exposure to toxic substances, and others centered on establishing potential root causes. We also check muscle strength and sensation at this point. Nerve Conduction Velocities (NCV) test. This measures how capable nerves are at sending electrical signals to the spinal cord. Electromyography (EMG). EMG testing measures electrical discharges made by muscle tissue. Pressure-Specified Sensory Device. We use this to determine subtle symptoms of nerve entrapment, injury, or neuropathy. Diagnostic imaging. Ultrasound, X-rays, and MRI (magnetic resonance images) are diagnostic tool used to determine if biomechanical structures are affecting the nerve. Blood tests. We may order blood tests to find out if underlying issues like diabetes, kidney disease, thyroid disease, or vitamin deficiencies are present. Medication – Either over-the-counter or prescription medication may be used to relieve painful symptoms. Topical medications can also relieve lower extremity nerve pain. Physical therapy – Our Three Lakes Physical Therapy & Wellness Center is staffed with physical therapy experts who can utilize NeuroMobilization (“nerve gliding”) to improve your condition. Multiwave Locked System (MLS) laser therapy – One of the advanced treatment options we are proud to offer our patients is MLS laser therapy. This state-of-the-art technology uses specific wavelengths of light to penetrate through tissue and accelerate cellular growth and reproduction in damaged nerves. Neurogenx stimulation – Another advanced option at Austin Foot and Ankle Specialists is our Neurogenx 4000PRO 2-Channel System, which uses electronic signal treatment (EST). EST promotes nerve and cell nutrition, which not only relieves symptoms, but also reverse many forms of neuropathy. Radio Frequency Ablation – This treatment can be used to prevent and interrupt transmission of pain signals from damaged nerve tissues. Surgery – When nonsurgical options have failed, you can take comfort in the fact that we have expert surgeons on staff who are committed to continually improving their surgical skills. This means you always have the best foot and ankle surgeons in the greater Austin area performing your procedure. This might be a lot of information to process, but the key takeaway we want you to remember is that if you are experiencing nerve issues—like peripheral neuropathy—in your lower limbs, come in and see our medical experts as soon as possible. Doing so is essential for successful treatment and the pain relief you need. Contact Austin Foot and Ankle Specialists for additional information, or to schedule a visit with either of our Austin, TX offices, by calling (512) 328-8900. If you’d prefer, you can also request your appointment with us online right now.